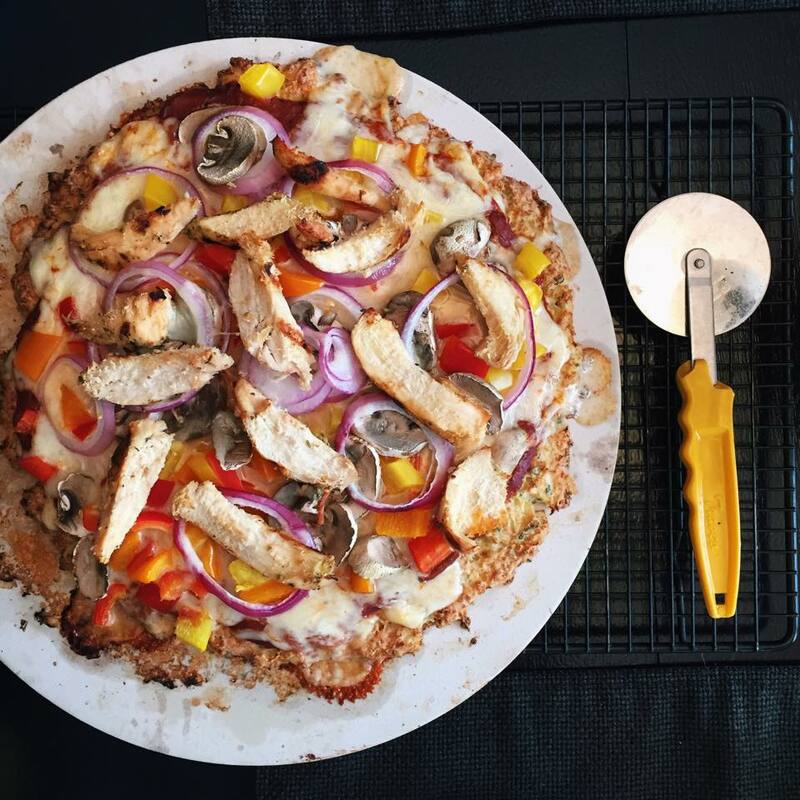 I have posted a Cauliflower Crust Pizza recipe before.. But I changed it up a bit for those of you who are allergic to nuts and couldn’t make it with the almond meal/flour. To be honest, I preferred the crust made with the almond meal a bit more than the brown rice flour. Both crusts are very tasty…. but if I had to choose between the two (and if you do not have any allergies) try my original recipe! — click here! 1. Chop up cauliflower into fine pieces or use a food processor (yield approximately 2.5 cups). 2. Once processed, put in a covered microwavable container and microwave for 4 minutes. 3. Allow cooling on a kitchen towel. When ready to handle, ring out as much water as possible from the cauliflower using the towel. 4. Add dry ingredients, mix. Followed by the wet ingredients, mix. 5. Use your hands to form it into a dough ball. 6. Lay out the dough on a baking sheet with parchment paper sprinkled with olive oil in your desired pizza shape. 8. Remove from the oven and add your desired toppings. 9. Cook for another ~12 minutes at 450 F.
Once you have added your toppings, change the oven temperature to 375F. Bake until the cheese is fully melted toppings are browning. I added chicken to mine — it was precooked on the barbecue. website’s post to be updated regularly. It includes good stuff.